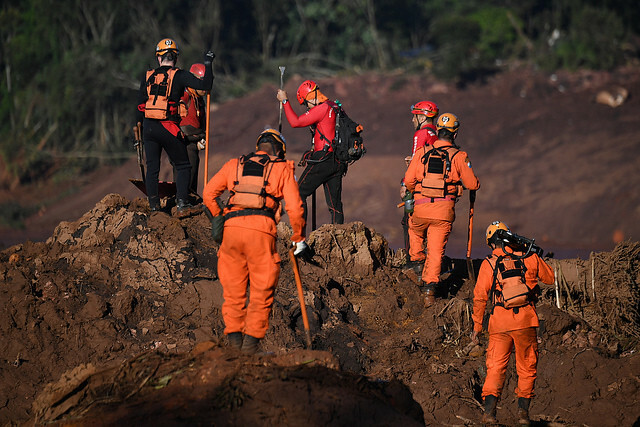 Rescue crews searching for survivors after a dam broke in southeastern Brazil last Friday reported today that 60 people have died and 192 have been found alive, while 292 are still missing. Of the 60 confirmed dead, 19 have been identified, authorities said. A dam belonging to miner Vale collapsed Friday in the Brazilian town of Brumadinho, Minas Gerais state, leaving a trace of death and destruction that could reach 19 cities, experts told Brasil de Fato. This Monday, Jan. 28, a group of 136 Israeli military officers joined rescue crews as local firefighters resumed operations on the fourth day of searches for bodies and survivors. Cabinet ministers and government technical officials met this morning in Brasília, capital of Brazil, to address the Brumadinho tragedy. According to Vale, the volume of mine waste released by the burst is 12 million cubic meters, or roughly 420 million cubic feet of toxic mud-like mining debris. The miner announced today that, following the collapse of its dam in Brumadinho, it will suspend dividend payments to shareholders and executive bonuses. Vale also said it established two committees to address the tragedy. While the mining giant argues they will be “independent” panels, their members will be appointed by Vale’s own board, a decision social movements have strongly criticized. Brazil’s federal attorney general, Raquel Dodge, said In São Paulo that Vale executives could be punished for the Brumadinho tragedy. On Sunday, a warning siren sounded as another dam is at risk of bursting near Brumadinho. Nearly 24,000 locals had to leave their homes and take shelter in higher areas. While there were emergency protocols in place before the collapse last week, residents reported the siren did not go off on the day the Brumadinho dam broke. Seven kilometers (roughly 4.3 miles) from the dam, the toxic mud has reached the Paraopeba River, a tributary of the São Francisco River, one of Brazil’s most important body of water. According to the country’s geological service, the mine debris have flowed 46 kilometers downstream and are likely to impact 310 more kilometers (192 miles) before reaching the Retiro Baixo power plant, which authorities hope will stop the mud.